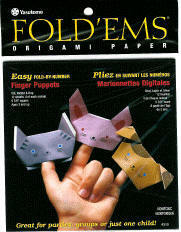 4 sheets each of 3 patterns. Includes cat, rabbit and dog, 4 each. Each sheet is 5-7/8" square. Ages 3 and up. easy to follow instructions included. English and French packaging/instructions. Lion Elephant and giraffe. 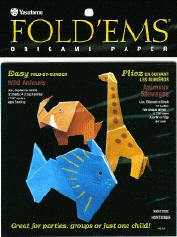 12 sheets, 4 of each animal. Each sheet is 5-7/8" square. Guidelines are printed on all papers, and easy to follow instructions are included. English and French packaging/instructions.